April and May have been a whirlwind for many of us, as the Trump/DeVos school choice agenda spreads to state houses around the nation. Over these last two months, grassroots activists across the nation have fought back against bad voucher and charter legislation. In some states our grassroots partners have been able to stop bills, in other states, bills have been made less damaging than they might have been, and some states are still fighting. Below you’ll find stories from two groups on the front lines of these legislative battles – Pastors for Texas Children and Fund Education Now from Florida. Please read and share their reports – the forces out to destroy our public schools are using a national playbook. We need to learn from one another and adopt successful strategies as we push back against the national school choice agenda. This month we also feature a report from our national partner, The Parent Coalition for Student Privacy. They’ve created The Parent Toolkit for Student Privacy to help parents protect their children’s educational data. Just in the last few weeks, there have been breaches of sensitive data by two major school vendors, Schoolzilla and Edmodo, and there are ongoing questions about the privacy of the voluminous student data collected by the College Board and the Summit/Facebook learning platform, among others. Be sure to share their invaluable toolkit with your networks. The Parent Toolkit for Student Privacy: A Guide to Protecting Your Child’s Sensitive School Data from Snoops, Hackers, and Marketers is a vital resource. At the close of the 2017 session this May, Florida legislators passed the worst package of public education policy in Florida history by a single vote. It is crystal clear to us that Texans love their public schools and do not wish to see them privatized through vouchers. Has your organization made use of the NPE Toolkit: School Privatization Explained? 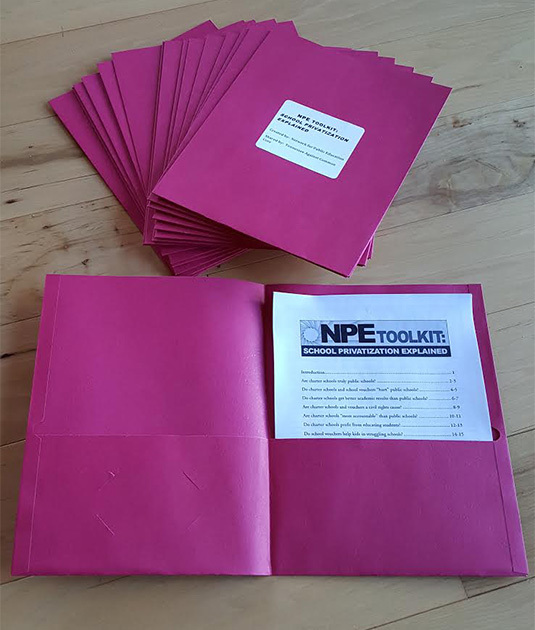 You are invited to use the Toolkit in any way you find useful – link to it on your organization’s website, like Iowans for Public Education, or print the toolkits and share them with your members or your legislators, like Tennessee Against Common Core. We created the toolkit as a resource to make it easier for you to continue to educate your community. Don’t be afraid to use it! 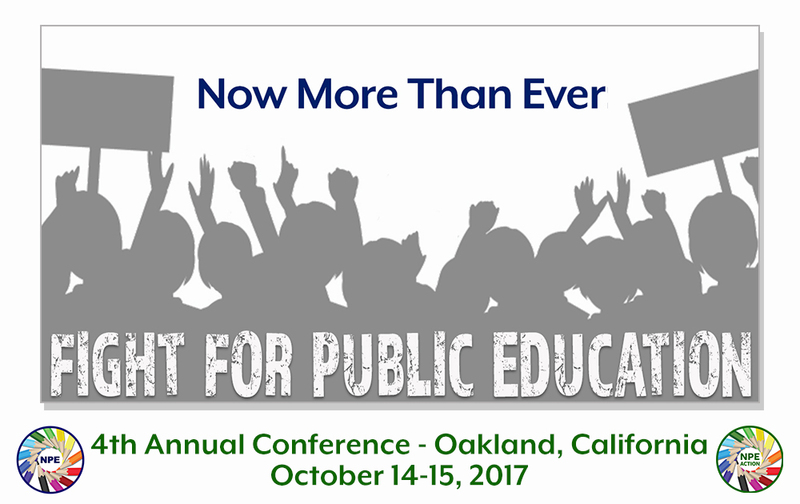 Have you registered yet for NPE’s 4th Annual National Conference? It will take place this year on October 14 and 15 in Oakland, California. This year’s theme is “Now more than ever: Fight for public education.” We are also planning a special event for Friday evening for those who can come early. This year we have limited conference space that allows only 500 attendees. And here is a link to make your hotel reservation at a reduced price. If you can’t attend the conference, but would like to sponsor an advocate who needs financial support to attend, go here. Please do not wait. We expect to sell out quickly, given the interest in public education. So save this email and register ahead of the crowd.